What a great weekend. I was expecting to go into this week feeling much more refreshed and motivated, but that just wasn't that case. Friday night I met some Friday at Sushi-O-Sushi to celebrate a friends birthday! If you haven't been to there it is an all you can eat, all you can drink of sushi and saki bomb's. It is sure to be a good time and we had a group of 16 join the party! I was excited to see friends I hadn't seen in a while and it was the latest night I have had in a long time. Saturday I had lunch with a friend before she headed back to Iowa and I forgot to take pictures - which I'm still regretting! And the rest of the day was spent grocery shopping and relaxing on the couch. Sunday we didn't move from the couch either. I got a quick workout in, but otherwise we just watched basketball all weekend! It's a really excited time in Chicago with the Bull and the Blackhawks in the playoffs! This week has been uneventful and I am already counting down the hours until the weekend. We are moving offices at work this week which means this week has been nonstop crazy. Hope you're all having a great week. Happy Hump Day! I couldn't be more happy that it's Friday! And I am even more happy that it's supposed to 73 degrees in Chicago today! It's going to be beautiful out! This week was a busy one, but that definitely helps the week go by more quickly. Here's a few snapshots of what I was up to..
Tuesday we had a girls dinner date at Lyfe Kitchen. If you haven't been I highly recommend. And on Thursday we kicked off the birthday celebrations for a great friend! And a few outfits from the week. I don't always remember to take a picture. I'm trying though! And the best outfit of them all..
Sunday nights always leave me a little sad. The weekends go by way to fast. This weekend was extra relaxing and the great weather didn't hurt either. Friday night I was on a hunt for boyfriend jeans and has zero luck. I am starting to this they just don't be flattering on me. I think they make me look shorter. I had to walk through Macy's downtown since it is just such a beauty! Friday night we ordered sushi and relaxed on the couch. We couldn't find anything good on TV and didn't see any good movies to rent either. If you have any recommendation, let me know! Saturday the weather was unbelievable in the city. We started the day with a trip to the gym. I tried a new class at the gym that was jump roping and it was really fun. The class was a lot of cardio and I wish it would have been a little more weights, but it ended with 15 minutes of abs so that was nice! My new work out top from Lululemon! After our workout we set out on a walk. We checked on the new Maggie Daley park downtown and it was really impressive! Although I think we were the only ones there without kids. Ha! Saturday night we met some friends at Southport Lanes for bowling. If you haven't been there I definitely recommend going to check it out. It has old school bowling lanes where they actually have someone behind the lanes setting the pins back up for you. We were with a group of 12 and we only had two lanes so the games were extra slow, but still a lot of fun! They also have a bunch of pool tables and ping pong tables that the boys had fun with as well. Sunday we barely moved from the couch. We went to get brunch at the restaurant right by our apartment called Johnny's Snack Shack. We fit in a long walk and a trip to get gelato from the new Whole Foods two blocks for us. I have to say the gelato is much better at Mariano's than Whole Foods! Have a great week! Can't wait until Friday! I hate to say it, but I think this week actually few by. Maybe that's because last week dragged on so badly since it was my first week back from vaca. It was a dreary week in Chicago with lots of rain and crazy weather. I am so anxious for warm weather and am so excited it's finally spring. This weekend will be another low key weekend and I couldn't be more anxious for Friday night. Although I have to admit, even on the dreariest day, this city is so pretty. I am on a hunt for a good pair of boyfriend jeans so if anyone has suggestions feel free to chime in. I may even run to Nordstrom Rack tonight to see what I can find. 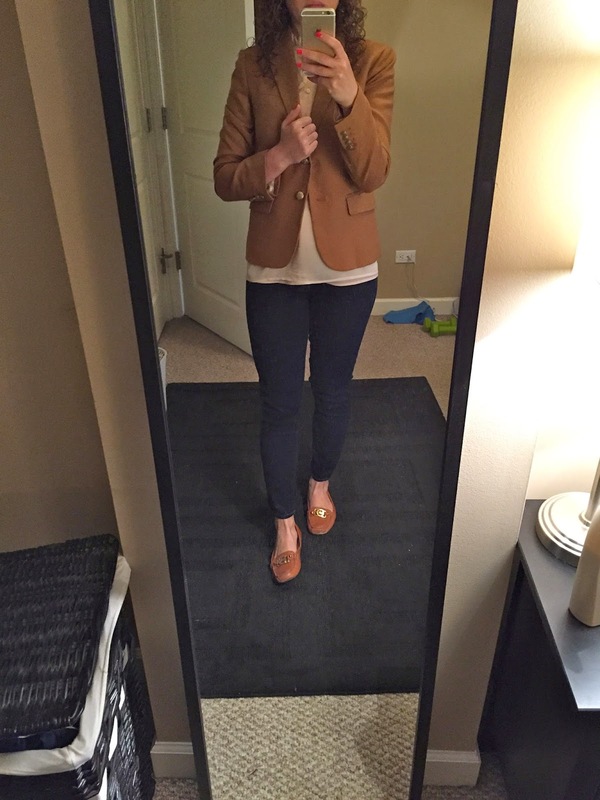 I found a new blog that is prompting me to downside my closet, as if that is going to be possible for me. She has a really interested way of organizing her closet and uses capsules for each season with only 37 pieces per season! I don't think I could be that extreme. My tulips I bought last week finally hit the trash can. They were gorgeous while they lasted and helped the apartment look fresh after coming back to a mess from vacation. I think I may need to make another stop at Whole Foods for another bouquet. Last weekend we ran out to the outlet mall in Aurora to buy me a new suitcase since my carry on broke for the 3rd time when we were in Roatan. The Aurora outlet mall has a Tumi outlet so I was hoping to find a quality bag for a low price. I succeeded in the first part of that, but it definitely wasn't cheap. The picture below isn't the one I bought, but I'm happy with my purchase. It was a nice carry on for $375 so still really pricey, but I'm hoping it lasts the rest of my life. Yes, I'm being a bit dramatic. I thought I'd add a quick update of what I've been up to lately. So here are a few photos to share from the month of March. I am so happy that spring is here. This week I had to skip the gym and stop by the new whole foods for some spring flowers. 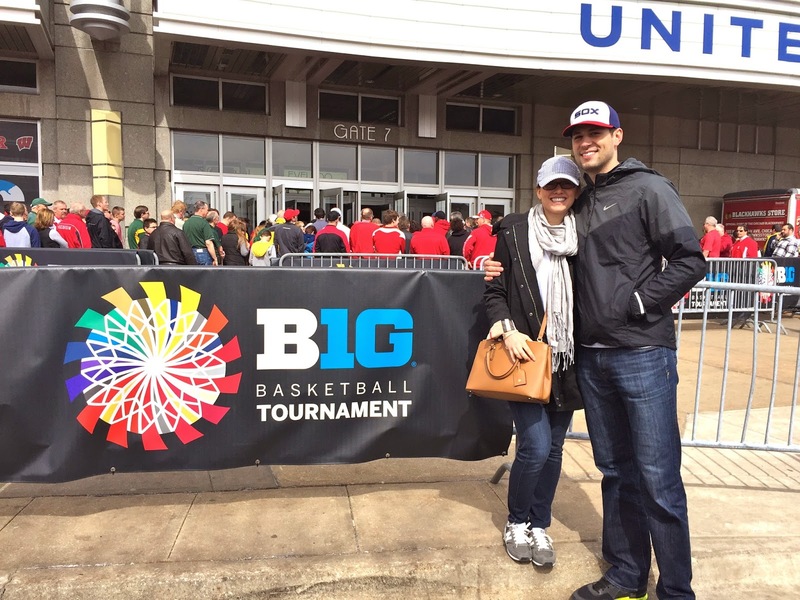 We were lucky to go to the Big Ten Basketball Championship game at the United Center. It was a great game and we were excited to see Wisconsin win! 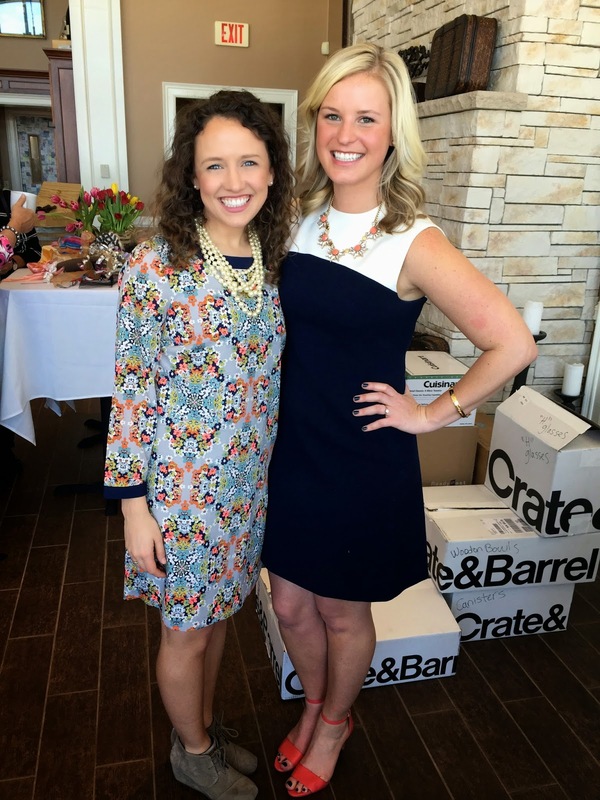 I went to a wedding shower back in Iowa for a great friend! I can't wait for her wedding this summer in Seabrook Island, SC. 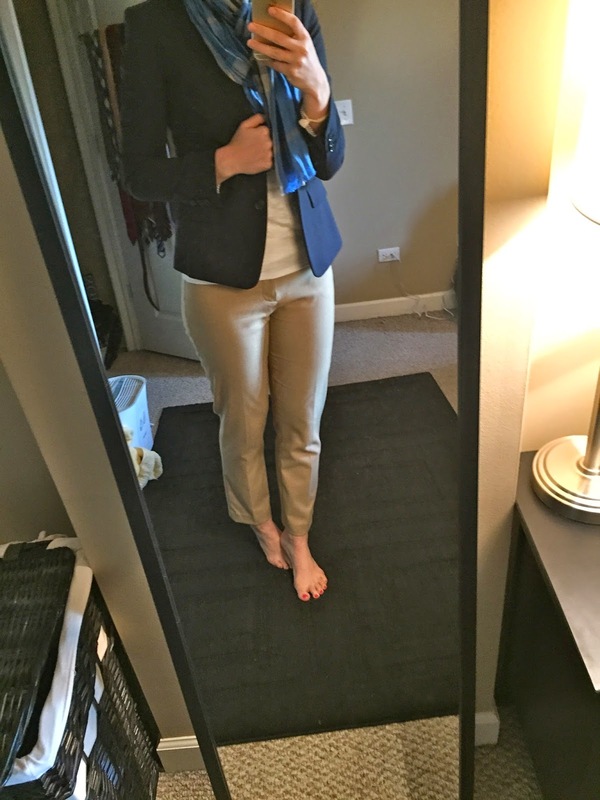 And to end, a few outfit posts from the past month. It was been crazy busy at work. Throw in a week long vacation in March and the whole month was a bit of a blur. 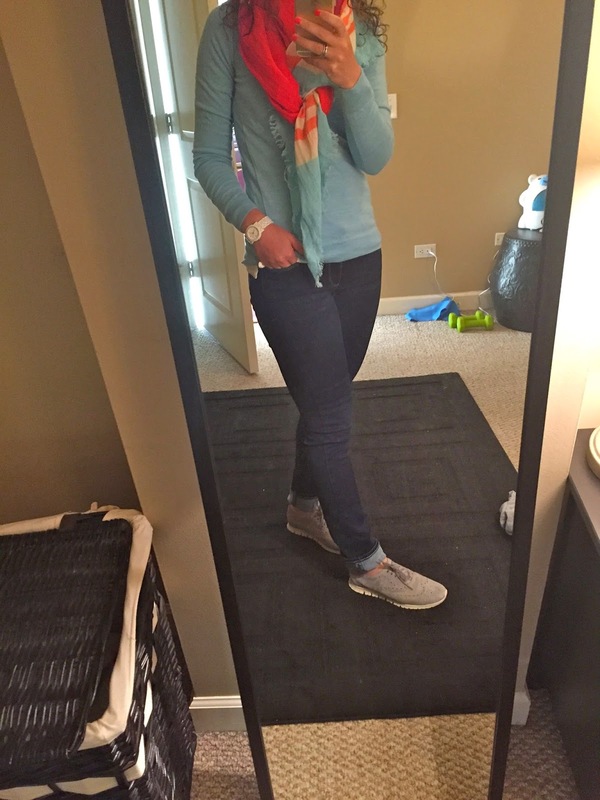 I'd been loving the warmer weather and it's definitely inspired me to pull out my spring colors! We just arrived back in Chicago from a glorious vacation to Roatan, Honduras. It was everything we hoped it would be and I think the pictures speak for the themselves. Sun. Sand. Ocean. It was really hard coming back to work on Monday morning. I will spare you everything detail of the journey as it consisted on a lot of laying on the beach, reading, snorkeling, eating, and drinking.